Designed by acclaimed, Pinnacle Award-winning designer Martin de Blois, our European Country Series wine cabinets evoke the timeless elegance of European furnishings. The European Country Series by Le Cache features architectural details such as crown and base molding, paneled sides, hardwood French doors and hand-carved accents showcase fine wine collections with a sense of luxury and style. Click Here to view moldings. 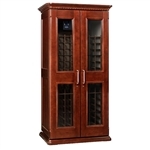 Review the cabinet's dimensions to ensure that it will fit easily into your entrance doors at time of delivery. For consultation, call Toll Free at 877-447-8000, in Northern California at 925-447-8000, or e-mail us at info@winecabinets.com. LE CACHE Euro 1400 Window Door shown in Provincial finish on Cherry wood. LE CACHE Euro 2400 Window Door shown in Provincial finish on Cherry wood. LE CACHE Euro 3800 Window Door shown in Chocolate finish on Cherry wood.